The other night, Steven was eating a pack of chicken fried rice microwave dinner and I was like, “Man, I could make this at home and I bet it’s easier, healthier, and cheaper.” It turns out I was right. Recipe adapted from here. 1. Earlier in the day, preheat oven to 350F. In a small bowl, combine brown sugar, soy sauce, cider vinegar, ginger, and garlic. Brush over chicken breasts in small baking dish; bake for about 40 minutes, flipping once to coat in sauce. Cool, shred, and set aside. 2. In a large wok or frying pan, heat sesame oil. Fry carrots and onion until soft. Stir in peas. 3. Push vegetables to one side of pan and scramble eggs in the other side. 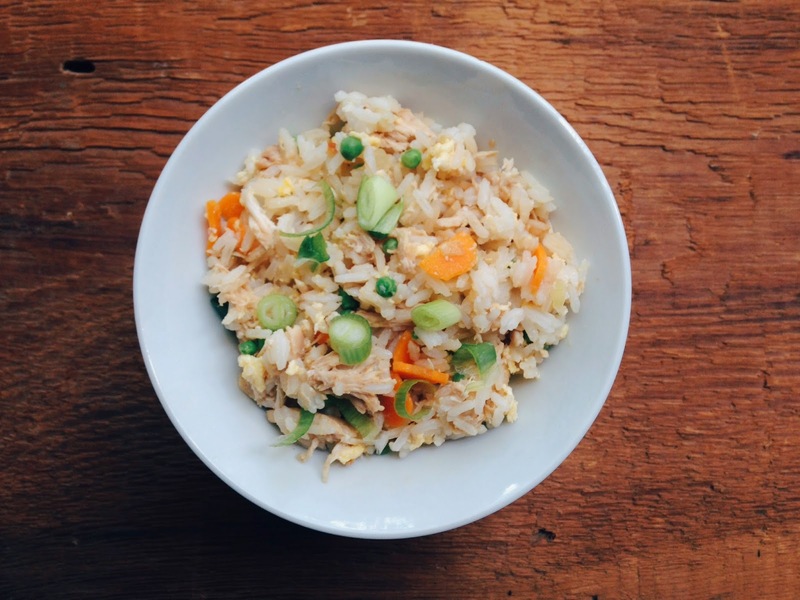 Stir together, then add shredded chicken, cooked rice, and soy sauce. Fry until heated through. Serve topped with green onions. Easy, tasty, healthier than boughten. We held back on the soy sauce and added more at table so it was very baby- and toddler-friendly.